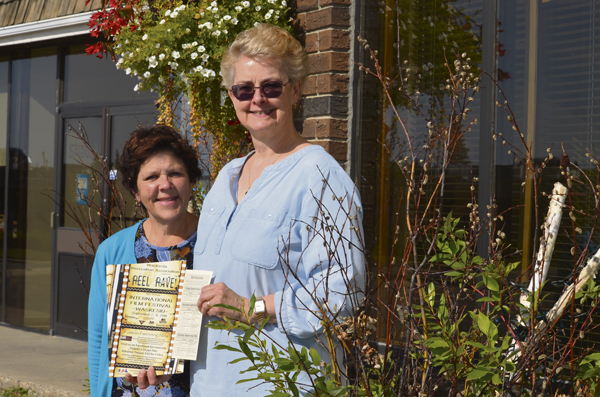 Jayda Noyes/ Daily Herald Committee members Amy Hadley (left) and Pamela Cuelenaere (right) pose in front of Amy's on Second restaurant, a sponsor of Reel Rave International Film Festival. Award-winning movies from around the world are hitting the screens of Waskesiu’s Twin Pine Cinemas this Friday, Saturday and Sunday. Reel Rave International Film Festival features six movies: The Death of Stalin, The Third Murder, Tulipani: Love, Honor and a Bicycle, Mary Goes Round, Puzzle and The Miseducation of Cameron Post. The event is organized by a group of volunteer committee members, including Pamela Cuelenaere. “We just try to get a good selection of movies that are going to be interesting to people that are our patrons at Waskesiu,” she said. A couple of the movies will be in different languages with English subtitles. The Third Murder, from Japan, is a drama from 2017. It follows the story of a factory president’s murderer whose criminal record trails back for decades. At first, his lawyer believes his client’s chances of winning the case are low, but begins to think he may not actually have committed the crime. Tulipani: Love, Honor and a Bicycle is from the Netherlands. The film is about a Dutch man who loses his farm to flooding and cycles to Italy to grow tulips in the heat of Puglia. But she’s found not everyone is a fan of subtitles, so the rest of the movies are in English. Regardless, she said, they aim for more artistic movies you wouldn’t normally find in a movie theatre. Three-movie ticket packages are available at the Twin Pines box office for $35 Friday evening and until the first movie on Saturday. After that, tickets are $14 each. The festival also includes a reception on Saturday night at the Hawood Inn, which includes wine tasting, food, raffle prizes and movie discussion. Proceeds go towards the Waskesiu Recreation Association and the Waskesiu Library. “I love movies and this is sort of my way of giving back,” said Cuelenaere, who lives in Prince Albert. She’s been on Reel Rave’s committee for about five years. In addition to these six films, viewers have the rare opportunity to see a movie filmed in Waskesiu in the 1930s to celebrate the park’s 90th anniversary. Parting of the Waterways was donated by its creators and can’t be seen by buying a copy or online. The film will play Saturday afternoon at the Waskesiu Heritage Museum–across the street from the movie theatre–with no cost for admission.